Foil shavers are great for getting precision shaves, and for making sure that all of your hairs are shaved. Most of these razors will get you the shave that you want in a single pass. That’s great if you’re short on time, or if you have sensitive skin. We’ve done our research to bring you the top ten foil shavers on the market right now. Here are some things you should know before we begin. Wet/Dry: If a razor can be used in wet and dry conditions, we’ll let you know here. This means you can use your favorite gel or foam shaving cream, and you can shave in the shower if you’d like. Power: Is it cordless or corded? Most of the shavers on this list are cordless, so you can use them on the go or when you’re traveling. A select few can be used both with the cord and without. Rechargeable Battery: A rechargeable battery will let you take the shaver with you when you travel. This is great for traveling, camping, and other adventures that take you away from your bathroom. Shave without the hassles of a cord. Blades: Here, we’ll tell you the number of blades in the shaver. More blades often mean more precision. When your shaver has more blades, you won’t have to pass over your beard as many times to get all of the hair. Dimensions: This will tell you how big the shaver is. This is important if you’re traveling and have limited space, or if you need one that will fit on a rather small countertop. We’ll tell you what you need to know. Pieces: How many pieces come in the box? This will tell you what you’re getting, including how many accessories you get. It can help you determine the value, and also what you may need to purchase separately. Now that you know all about these razors, we can get into the foil shaver reviews. Our favorites are the top pick and budget pick, so check those out before moving on to the rest of the list. We’re sure that you’re going to find your next favorite travel shaver on our list. You can take most of these foil shavers just about anywhere to get an amazing look without breaking out a disposable razor. The best men’s foil shaver that we could find is this one by Braun. Braun is a well-known name in shaving devices and accessories, so much that certain other brands use Braun technology. Why not go right to the source with the Braun Series 9? It has a specialized head, designed to shave more individual hairs in the first pass with a five-blade structure. This leads to a closer, more efficient shave. It has a precision trimmer that slides out to get those delicate areas, like sideburns or the areas around your mustache. 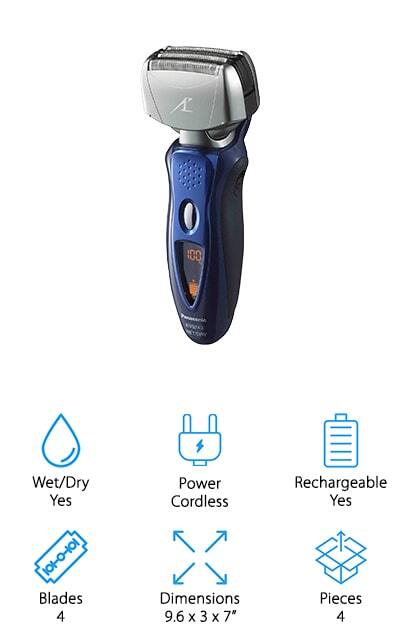 The best part about this shaver, though, is the AI that automatically fits the features of your face to allow you to get the best shave you possibly can. It’s completely waterproof, so you can use it in the shower, with gel and without. It comes with a Clean&Charge station that cleans, lubricates the blades, and charges your razor with a single button. When you want a clean shave on a budget, go with the Remington F5-5800. This foil shaver stays close to your skin with both of its blades, allowing you to get a smoother shave that follows the planes of your face. It pivots across your jaw and cheekbones and trims your longer hairs on the first pass so that you can go over it again and get a perfectly close shave. You can wash it under the faucet when you’re done using it. The rechargeable battery will last you for about 60 minutes of use without interruption. It includes a pop-up trimmer for all of those little details, including finishing touches on facial hair and sideburn areas. The 3-stage cutting system is what makes this shaver really shine, with the intercept tool for pre-trimming, followed by the flexible foils to shave closely. A single charge will last you for about 20 days before you have to charge again. 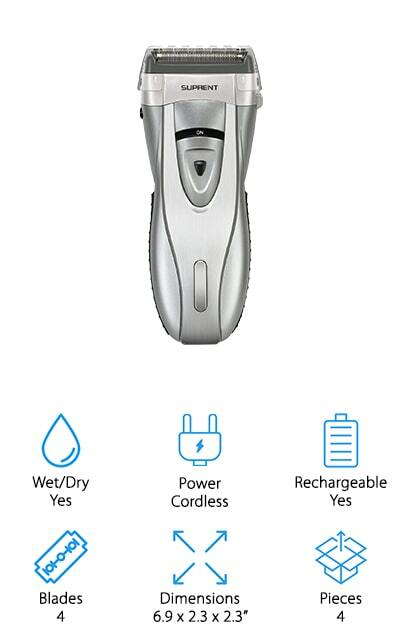 The Panasonic Arc5 is one of the top foil shavers for a reason. It has five different Nanotech blades, which are sharpened to a precision edge and angled at 30 degrees. The ultra-thin foils adhere right to the contours of your face so you get a comfortable shave that’s quick and close. 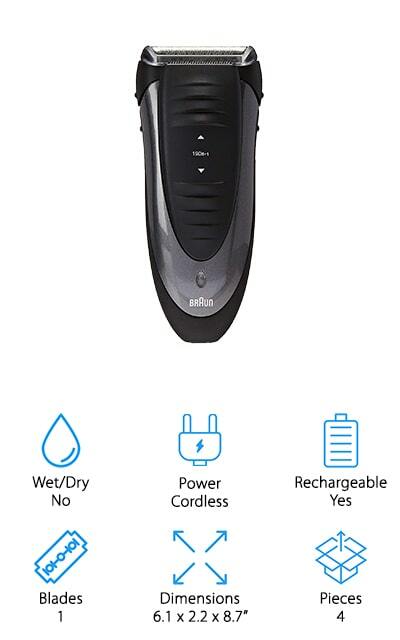 It’s a wet/dry electric shaver that also comes with a pop-up trimmer for detailing mustaches and sideburns, as well as getting the perfect edges on your beard. The multiflex pivoting head traces the contours of your face. It includes an LCD display that tells you the complete status of the battery. It will last a long time on a single charge, which means that you can take it with you everywhere, even on long trips. The motor delivers about 14,000 cuts per minute with is absolutely amazing. You’ll get a shave that’s close and comfortable and that you can take with you everywhere. 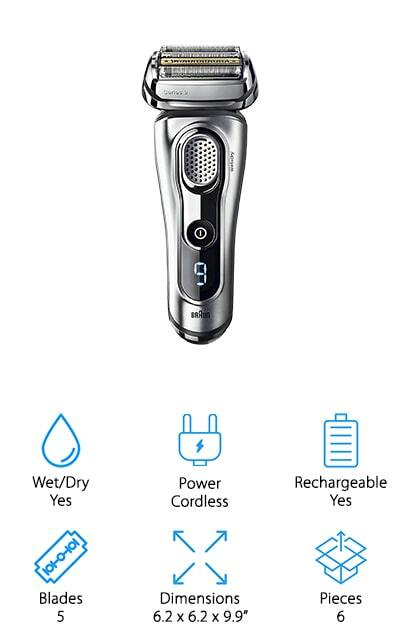 SUPRENT’s Electric Foil Shaver features 3 independently floating blades to shave close to your face and eliminate stubble - unless you want it. Each of the blades is made of stainless steel, which is surgical grade - perfect for shaving without irritating skin. It can be tough on coarse beard hairs while still leaving your skin without any redness. The battery charges quickly, and you can do a five-minute charge that will hold up to a single shave. 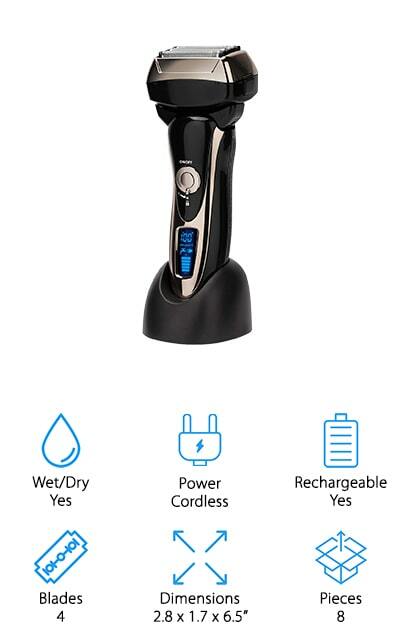 When it’s fully charged, you can get a full 70 minutes of runtime out of your shaver. If you shave every day and don’t need a whole lot of time, it can last you a fairly long time before you’ll need to recharge it. For traveling, it includes a sliding lock switch to keep it from turning on during travel. 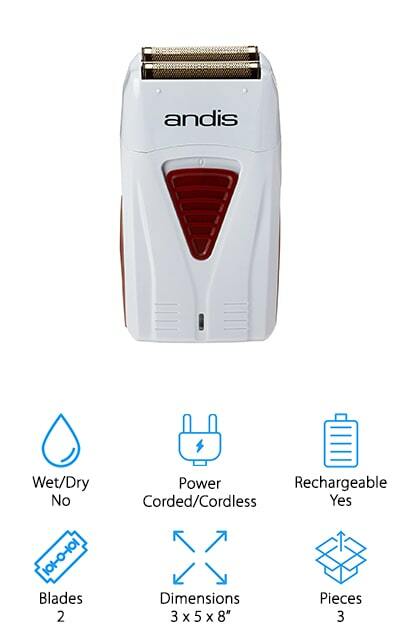 It also has global voltage capabilities so you can take it anywhere you want to go! It even comes with a cleaning brush. The Panasonic Arc4 is the Arc5’s predecessor and only includes 4 blades. However, those blades are still ultra-sharp Nanotech blades with precision edges. The ARC foil is extremely thin and together the blades and the foil will follow the contours of your face for a comfortable shave. You can use it wet and dry, and the blades are hypoallergenic so that they won’t bother your skin. 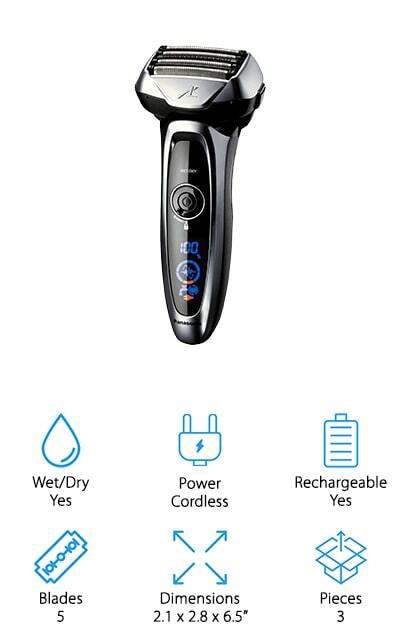 The motor delivers an amazing 13,000 cuts per minute, so you know it’s going to grab all of your hairs and give you a smooth shave. To accomplish this, the blades use both back-and-forth and side-to-side motions. You can use it in the shower or at the sink because it’s waterproof as well. It’s portable, and a single charge will last you a long time. You can check the battery status with the LCD screen on the shaver. It even has a sonic vibration cleaning mode so you can rinse it under running water. This Andis Profoil is the best foil shaver for sensitive skin that we found during our research. The foil heads are staggered, and each blade is hypoallergenic so even the most sensitive of faces can enjoy less irritation. It also has an amazing battery life, at about 80 minutes of nonstop runtime without ever having to charge it again. Plus, you can operate it cordless or corded, so you don’t have to stop in the middle of a shave if the battery dies. That’s a great feature! 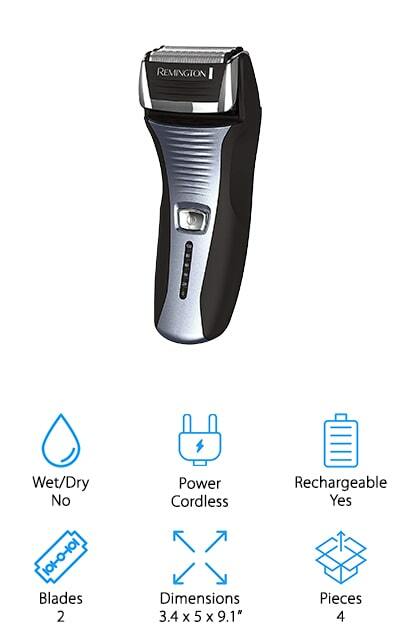 This shaver performs best when used dry. The motor is quiet and powerful, so you won’t disturb anyone with your early-morning shaves. It will even remove stubble for an extremely close, less-irritating shave that you’re going to love. Andis recommends that you oil the blades before you use them for the best results, that way they can glide over your skin like they were intended to. You’ll love it! Lyker makes this foil shaver with a powerful linear motor, which puts out an amazing 15,000 rotation per minute. Your shave will be clean and close and you won’t get any of the painful tuggings that slower shaves give you. Even the densest of beards can be dealt with in moments. That’s what makes it one of the best foil shavers for head shaving – you can avoid tugging, even if you have thicker hair. As long as you trim it down first, you’ll have nothing to worry about. It’s got a travel lock so it won’t turn on in your bag, and a 1.5-hour charge will last for an amazing 60 minutes of shaving. That makes it ideal for long trips. You can use it with your favorite foam, or shave in the shower if you like. The four blades in this shaver are amazingly sharp and angled at 40-degrees for easy removal and replacement. ROZIA’s Electric Razor charges quickly via USB, so you can use a power bank or iPhone charger. That alone makes this foil shaver perfect for camping and other traveling adventures. You can charge it in the car with the proper adaptor, and that’s pretty amazing. It’s waterproof and you can use it wet conditions and dry ones. You can use it with your favorite foam or gel shaving cream easily. It contains a two-way pop-off blade so that you can easily clean the blades and make sure they’re staying sharp. It has a pop-up trimmer as well so you can get those finer details shaved away. The induction motor will help shave away even the densest of beards and works well for sparse hair too. 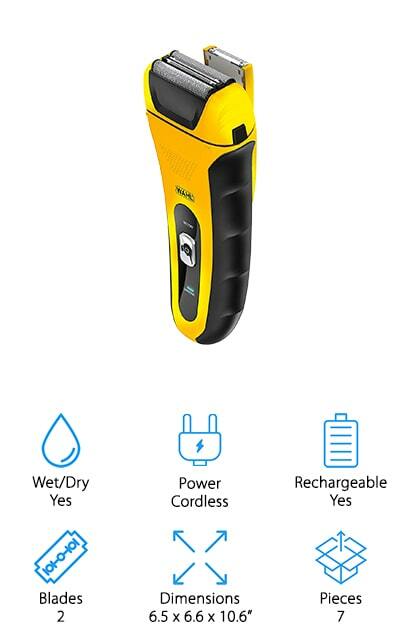 It’s a compact shaver with a long battery life that you’re going to love taking with you on trips. Plus, it’s designed to repel dust and water from entering the motor casing. When you want a quality shaver that’s proven to get you the closest shave possible, you want a Wahl shaver. This is a renowned brand that’s been around since 1919 and has delivered quality clippers and shavers ever since. This foil shaver can be used wet or dry and has a nifty shock-resistant casing so that you can take it with you on the road without fear. It has two precision blades that will get you the style that you want, even with the densest beards. On a full charge, you’ll get 90 minutes of shave time. If you have a sparse beard or just do quick touch-up shaves each day, one charge could last you most of the month. The LifeProof shaver comes with a kit that includes the shaver, charger, and a storage pouch, as well as a styling guide if you want to try something new! The battery won’t lose potency over time, either. Braun is back on our list with their Smart Control Foil Shaver. This foil shaver’s claim to fame is its ability to grab all of the hairs in any area that you need shaved and shaving them down so that you won’t miss any hairs. You’ll get a more consistent shave than your current shaver! It’s completely washable, so you can easily clean it under running water to get the best results each time. You can run the shaver for up to 30 minutes on a single battery charge, so you’ll definitely be able to finish your face cordlessly. It’s got a precision trimmer for longer hairs, and it reacts to touch. This means that the shaver adjusts to the pressure that you apply for the perfect shave each and every time! If you’re looking for an upgrade but don’t want to break the bank, this is the perfect shaver for you. 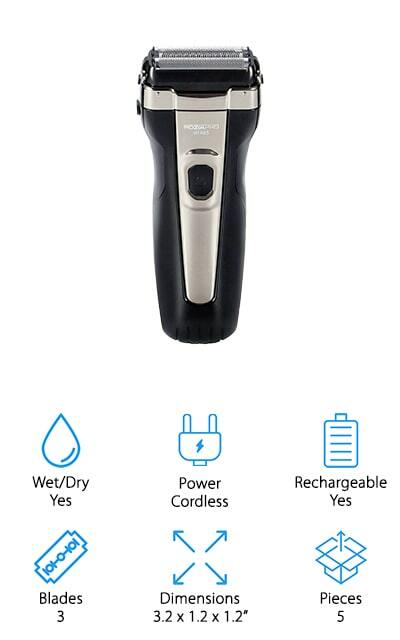 Quality and price come together in this shaver!